Kauai: Exploring the Garden Isle - Where to, Peanut? The nickname ‘Garden Isle’ is the most beautiful understatement ever made. 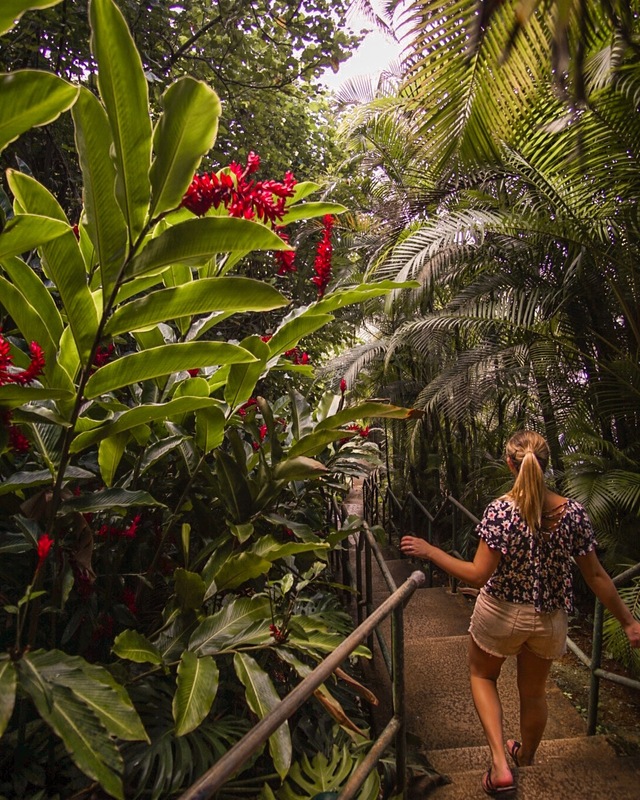 Kauai is lush and green, with flawless flora and gentle streams. It ticks the boxes of a garden readily. But, Kauai is so much more. Kauai is wild and untamed, with rivers that engulf highways, and waterfalls that appear spontaneously on mountainsides. It is slippery red mud that will stain your clothes, leaving a memory of your explorations. It is wild beaches, and massive vines growing untethered. It is sheets of rain giving way to brilliant rainbows. Kauai is a place that entices exploration, and guarantees amazement. The North Shore of Kauai is a landscape out of Jurassic Park, quite literally (the movie was filmed there). 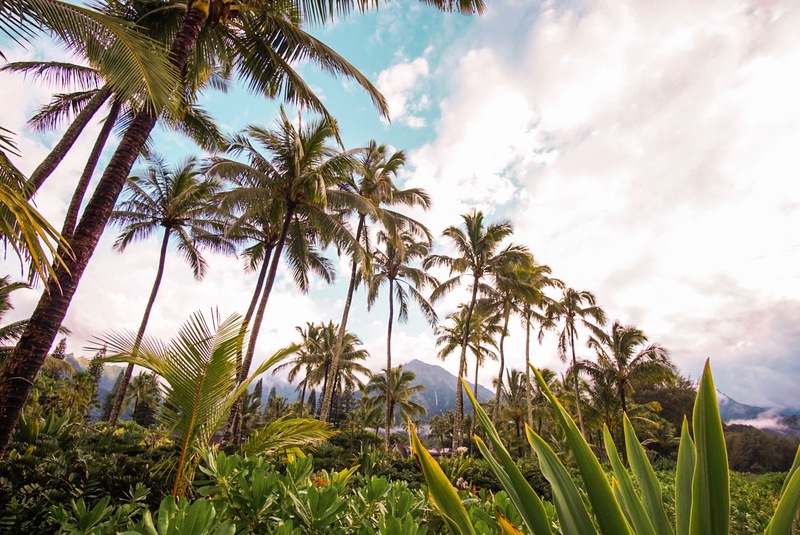 From the towns of Princeville, Hanalei, up to Haena and beyond the sense of untamed beauty amplifies. Although, as a whole Kauai is, in my opinion, the most beautiful Hawaiian island, the North Shore is a heaven within a heaven. 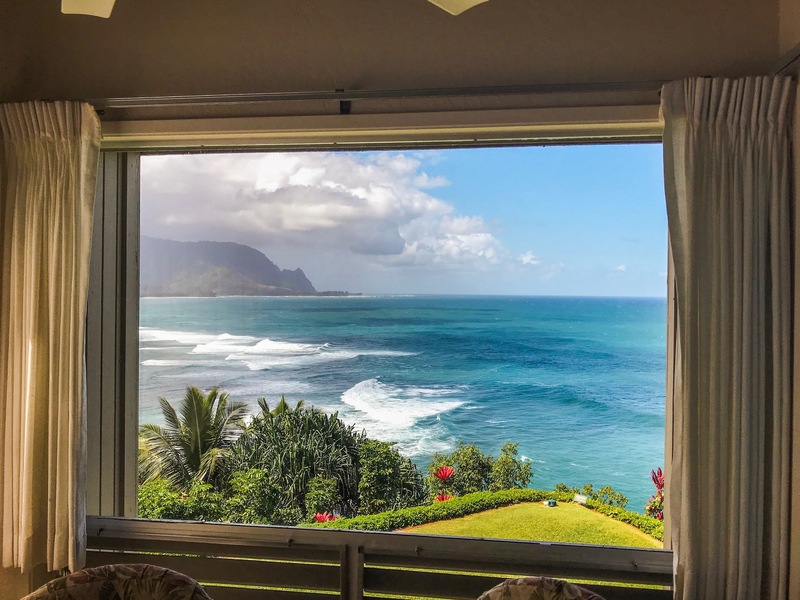 I chose an Airbnb in Princeville with a view of the Bali Hai mountain, overlooking Hideaways Beach at the Pali Ke Kua complex. Not only did this condo feature an identical view as the nearby St. Regis Kauai, but it did so at roughly 1/4 of the price, with a spare bedroom and full kitchen to boot! The view, pictured below, was spellbinding, and when it rained I relished at spending time out on the covered lanai with a cocktail, admiring the gorgeous mountain view and the wild winter swells below. Princeville, where our condo was located, is more planned residential community and less town. So, for the meals we didn’t cook in the condo, we drove the 7 minutes down to Hanalei. Of everything we ate on Kauai, my favorite by a mile was the taco truck in the parking lot for the Hanalei Pier. I don’t know if my hours in the sun and playing in the waves of Hanalei Bay influenced my impression, but the tacos were amazing! Ama, an Asian fusion place set in a breezy open-air configuration viewing the mountains was a wonderful happy hour spot with inventive food. We also had a beautiful meal at Postcards Cafe, in which my husband and I had lantern-lit dinner of fresh catch out on the screened front porch during a rainstorm; incredibly romantic. 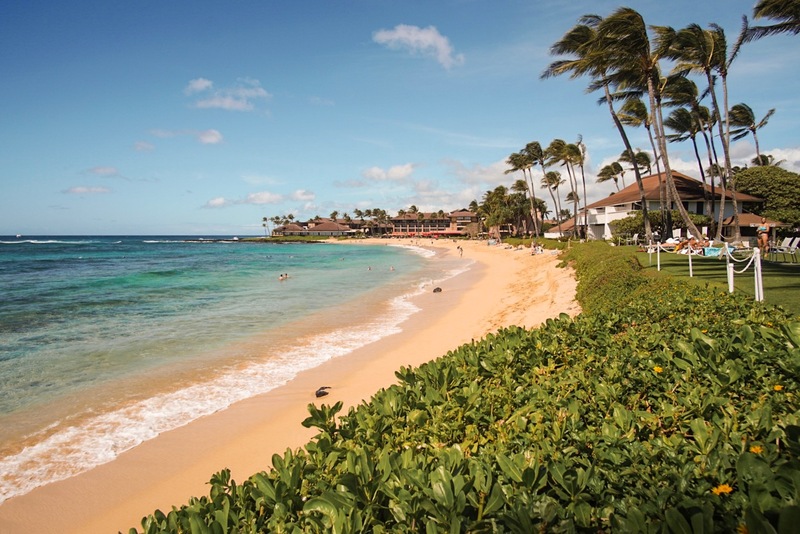 The North Shore beckons you to explore it’s wild and untamed beaches. 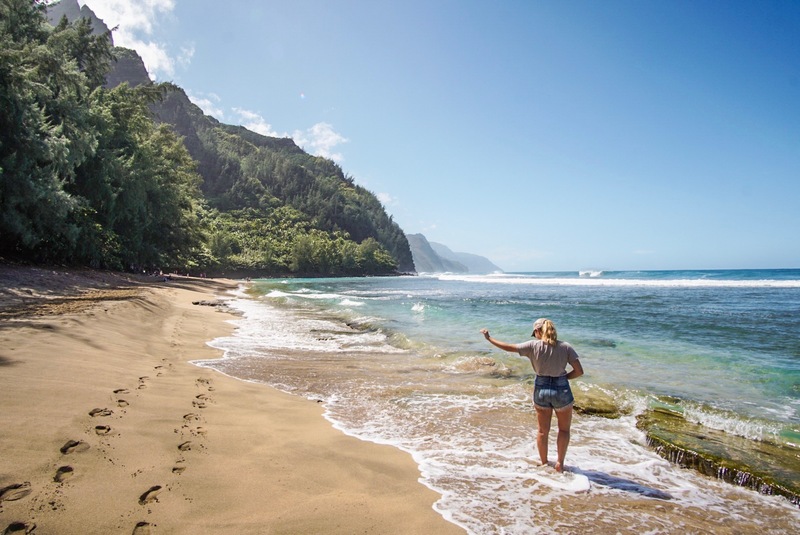 Most beach on Kauai are not suitable for swimming due to dangerous currents, so please be aware! What they lack in swimmability, they compensate for in beauty. 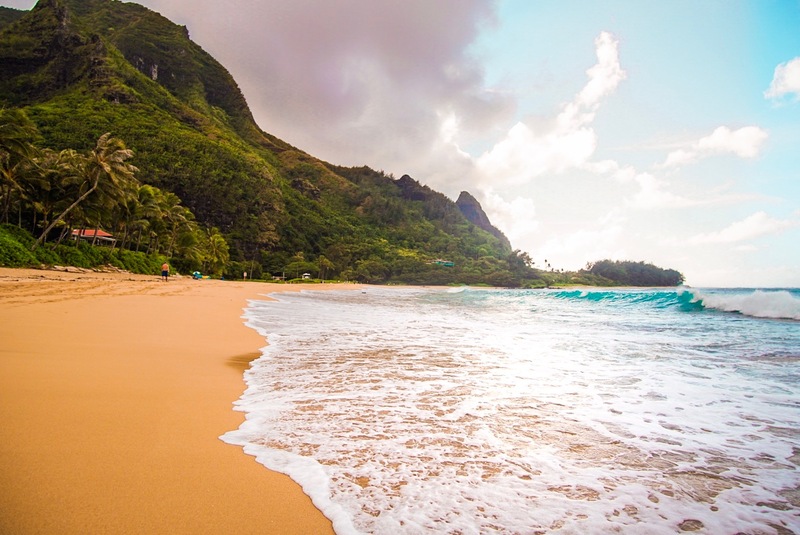 My favorite, Haena Beach Park, aka ‘Tunnels’ is a beautiful long stretch of sand set against the iconic mountains that the North Shore is famous for. 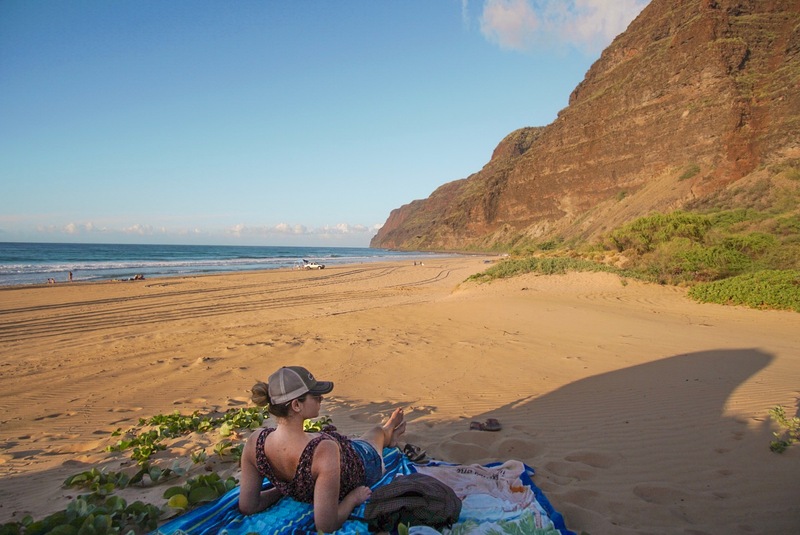 Ke’e beach is the nothern-most point you can access by road, and is a nice place to rest after hiking a portion of the famed Na Pali coast. 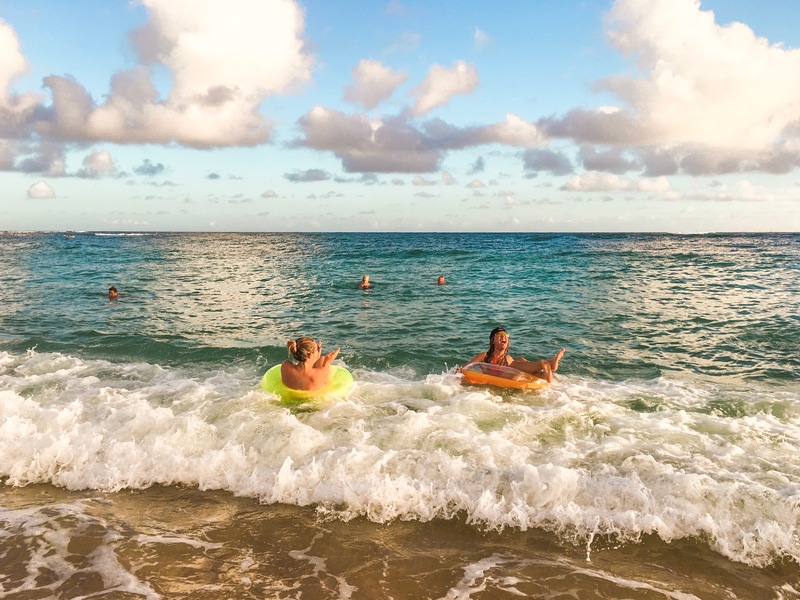 If you’re looking for a place to swim, Hanalei Bay’s gentle waves is your best option. 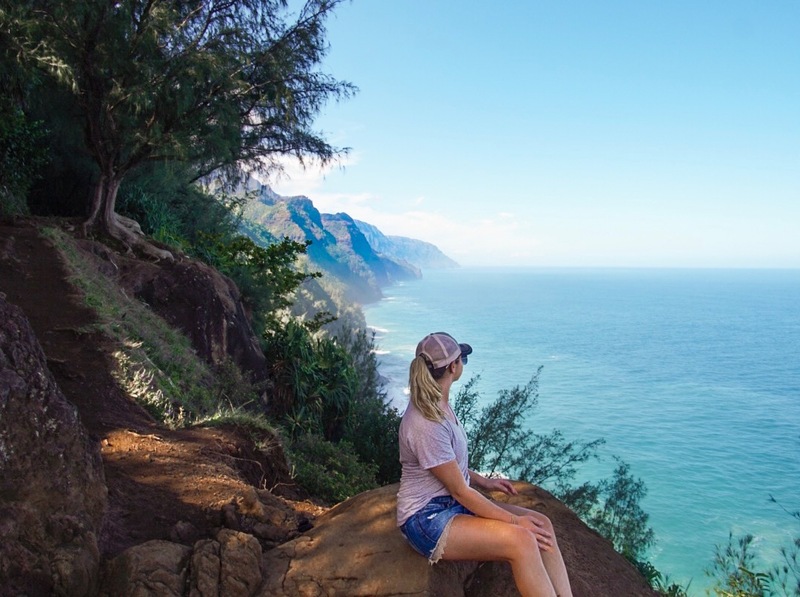 The Kalalau Trail on Kauai is, without a doubt, one of the most beautiful hikes in the world. The notoriously difficult and dangerous trail snakes along the jagged mountain ridges of the Na Pali coast, giving way to larger than life views of the otherwise inaccessible coastline. The first couple of miles are suitable to casual hikers, but beyond that — please be prepared! The hike frequently involves a sheer cliff face up on one side, and a sheer drop hundreds of feet down to the Pacific on the other with a small strip of trail, which comprises of slippery Kauai mud, in the middle. Let the trail dry out for two days after a big rain for ideal conditions, and if you are in doubt — turn back. I made it about a mile before a flash rainstorm turned the trail into a slip n’ slide that was unsafe, if not downright dangerous to hike on. 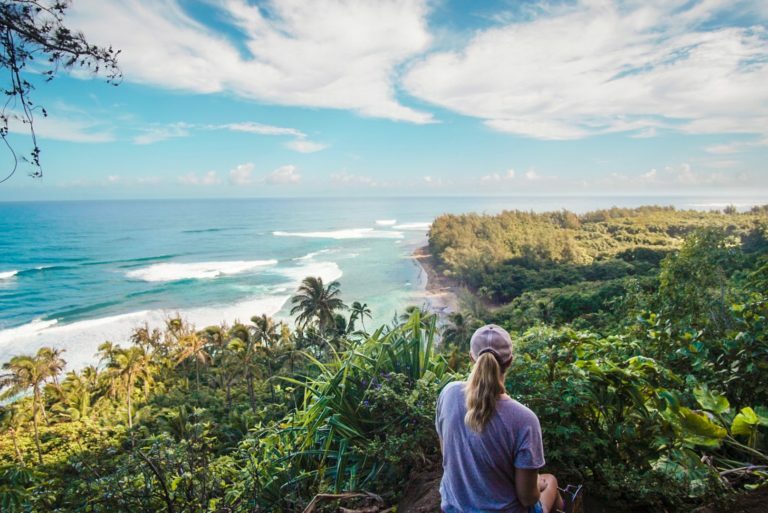 The South Side of Kauai is a dream unto itself, though drastically different than the lush tropical flora of the North Shore. Here, you’ll find a drier climate with seemingly endless sun, and more swimmable beaches. Although there is less tropical greenery around, the seas are a more brilliant blue. Again, I chose an Airbnb, this time located with sunset views over the Pacific. Located at the Poipu Palms complex, our condo shared a pool on a deck partially over the ocean. 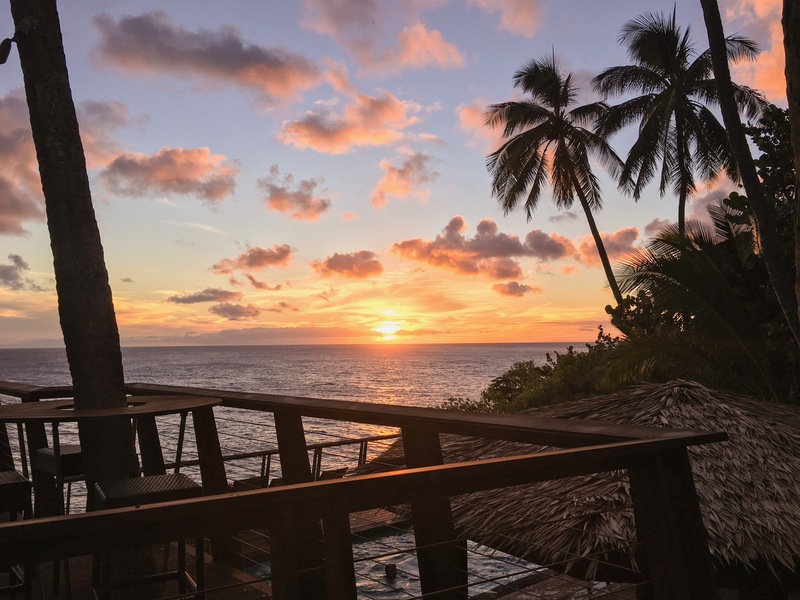 Our lanai viewed the ocean through a fringe of palm trees and was a stunning place in the evenings as the sun melted beneath the horizon. We ate very few meals out while in Poipu because our view beat everything else! My favorites: poke bowls to go at Living Foods Market, and traditional Hawaiian mixed plate at Mark’s Place. 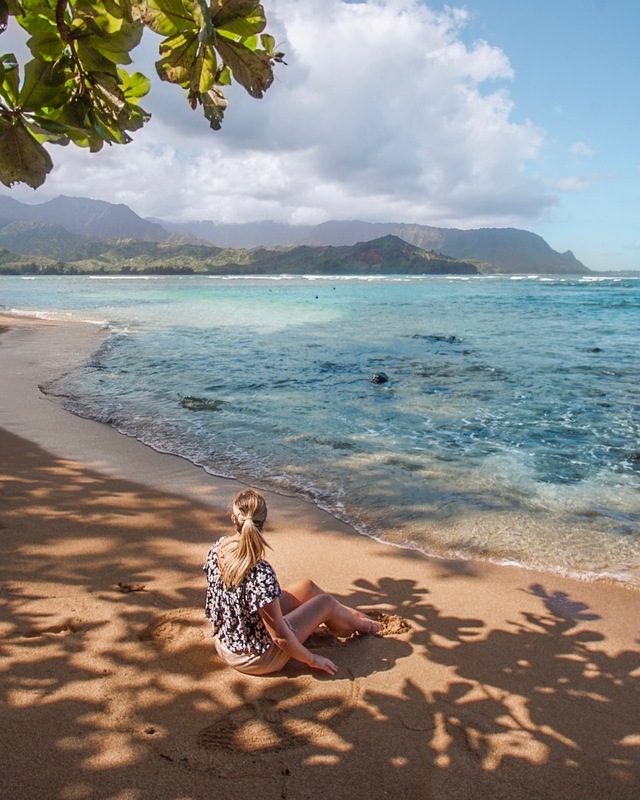 The beaches of South Kauai are a place where a day can go by in an instant. Brennecke’s Beach is, by far, my favorite. Although it can be crowded on nice days, the narrow strip of sand ensures nobody will plant their towels directly in front of you. The clear sea is wonderful for swimming and playing in the waves. In my case, it was perfect for inner-tubing with one of my best friends! 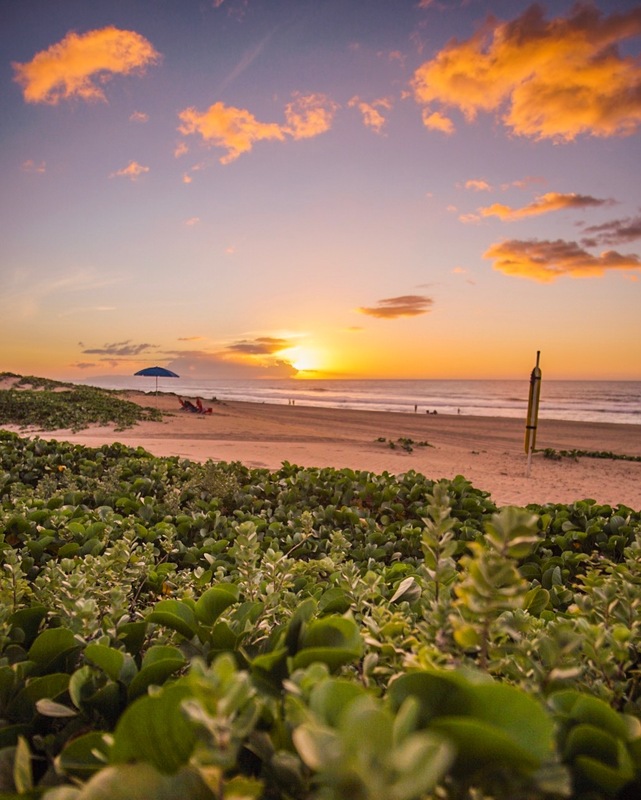 Driving west from the south side quickly gives way to a drier landscape, but if you continue quite literally as far as the road goes you will land on one of the best beaches on the island, Polihale. Completely out of the way, and only accessible via a very bumpy dirt road (word to the wise: rent a jeep), Polihale State Park is a gem that gives you a glimpse of the Na Pali coast from the south. It’s also a phenomenal spot to watch the sunset! Waimea Canyon is a true Kauai wonder, and is best accessed from the South side of the island. Driving through it is marvelous, but in order to get the true feel, taking a hike is the best! I highly recommend the Waipoo Falls Trail to experience gorgeous canyon views. The trail stops at a small waterfall with a gorgeous pool, and then terminates at the top of gorgeous Waipoo falls, overlooking the vast Waimea Canyon. I hiked the 5-odd miles in dry conditions and I would describe it as moderately challenging for a fit person, but very doable! 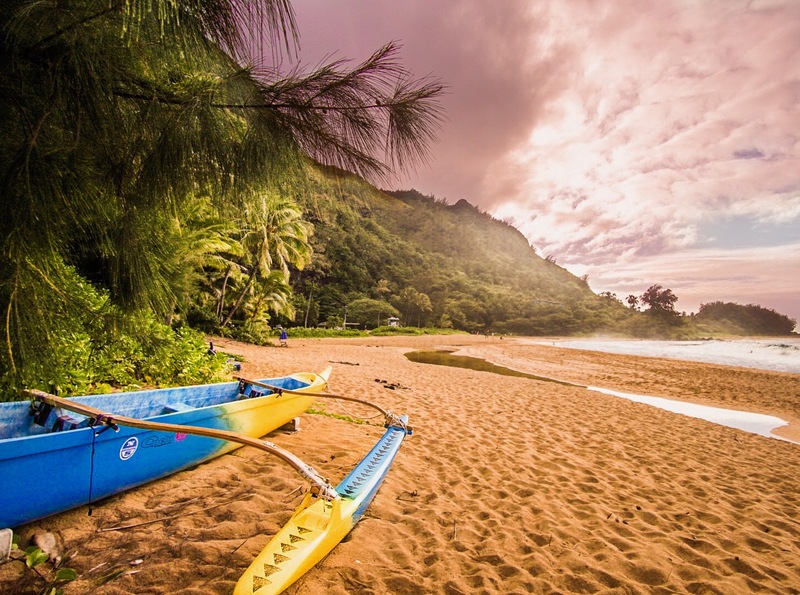 Kauai is a dream within a dream in Hawaii. 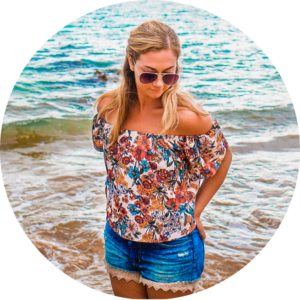 Though I am more familiar with Maui having visited more often, Kauai all but swept me away with its wildness, abundance, and beauty.